After another 10 minutes or so, Griffin climbs down the rope and says they force is at the front doors.Remar looks to Griffin and whispers, "Are they going alone, forcing the Traldar through alone, or all coming in at once?" Griffin says "They made it to the front door. That was when I was supposed to come tell you." Griffin breathes heavily from his rapid climb down. "You want me to go back out and look again?" Remar reminds everyone of the sealed off, narthex-like inner room before the nave with the pit of fire, that may in fact not be burning...as everyone assumes beyond the door outside which they stand leads to the naive. Draven says, "And we'll want to do everything we can to protect those who aren't there of their own free will. Kasiex, you may do well to stay back and snipe, lest they lay eyes on you and decide you are an enemy." Kasiex says "This has been said. This I will do." Remar says, "Should we check this door for magic and if yes, address that and if no take a peek?" 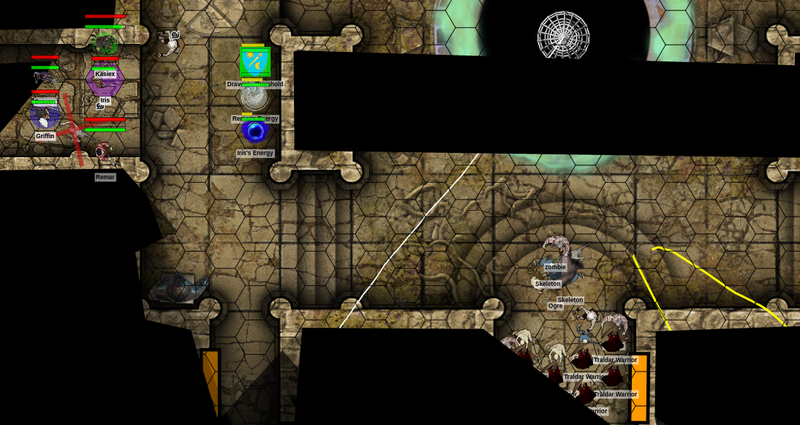 Remar assesses the door for magical traps and does not detect any arcane traps on the door. Remar says, "For what it's worth, I do not sense any magical traps, up front." Iris says, "I can eliminate sound in the area around the door so that we may enter silently, at the least" She then checks the door for magical traps as well and is fairly sure she sees markings and other things that would indicate a magical trap! She realizes that opening the door could be dangerous! Iris says hurriedly, "Wait, no one touch the door! See these carvings here---and here? I'm reasonably certain they indicate that the door is trapped." Draven says, "Let me get in there for a second..." Remar gives Draven some space at the door as Iris moves gingerly to the side to allow the priest to move by then moves to the rear of the group to watch for anyone sneaking up from behind. After casting his divine spell, Draven does not detect magic of any kind on these doors.Draven waves his holy symbol over the doors. "There's no magic on these doors... perhaps these runes are already spent?" Remar says, "If it's not locked, and not magic'd. Maybe we can crack it so we can peek?" Iris says, "Why don't we cover our light sources first and I'll eliminate sound in the immediate area so that we might get away with opening the door without being noticed. At the very least, we should cover our light sources. It may be more beneficial to be able to hear what's going on in there than to worry over the door scraping"
Draven says, "Yes, an area of silence is good, but be ready to drop it in a heartbeat if we're forced to fight from here, lest our own mages are silenced." Far out into the chamber, he sees a handful of undead huddled against the south wall, flanking the entrances to this room. They all seem to be waiting in ambush. As Griffin quickly scans the area, he locks eyes with one of the ghouls. It snarls and raises its gray, dead-flesh hand to point in your direction. Griffin 's lips curls. 'Ghouls. I hate these guys' he mouths, though no sound is heard. Iris tries to say, "The Ogre went in first?!" but no sound comes out. She mentally adjusts and ends the ongoing silence spell. Draven says, "No doubt their bluntest object to lead with. I suspect we'll be able to hear when battle is joined and time our counter based on that"
The Ogre had been at the rear of the column the whole time it had been observed but now obviously moved to the front. Iris says, "Ok, Draven, I'm probably getting ahead of myself, but the Traldar are really superstitious, right? We don't want to fight them, so what form can I shape the fire into in order to frighten enough to make them run out of here once they enter?" The double doors separating this area from the main room are thick, but a battle can be heard on the other side. Clashes of metal on metal and stone. Screams and cries of fear fill the air. Great bellows from the Ogre are unmistakable. Iris says, "Ok, I'm going to shape the fire into a giant jackal's head. Remar---can you drop it as though it's emitting from the mouth of the fire shape? It being the smoke. Sorry to expect you to read my mind. I'm a little nervous"
Remar says, "I can, but I thought I was going to drop it amidst them based upon their formations, if there is any formation at the point we enter"
Iris reconsiders, "Given the distance, I suppose I'd need to run in there"
Griffin prepares his crossbow as Draven pushes open the doors allowing the group to evaluate what's happening and engage. Kasiex moves up, bow in hand. 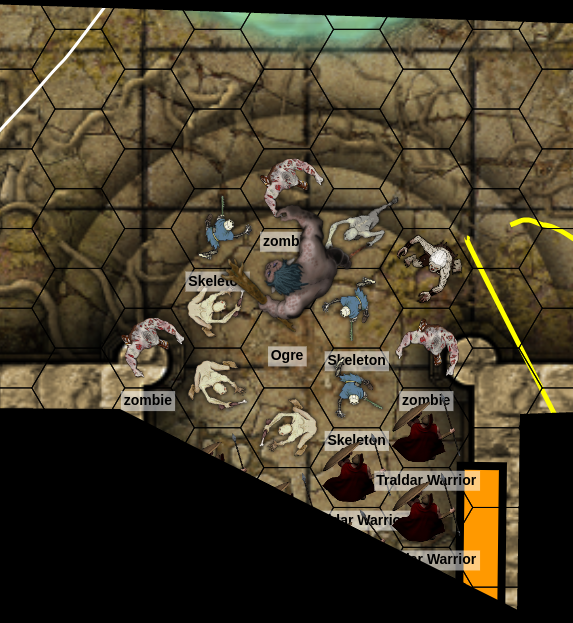 Ahead, are the Traldar and Ogre engaged with a bevy of undead. Ghouls, Zombies and Skeletons! The Traldar look completely overwhelmed and while defending themselves, they are trying to push their way back out to the south, through the passageway seems to be too crowded to move. Griffin aims and Iris draws her crossbow while Remar slinks forward in the shadow of the fire buffering pillar and Draven prepares a bolt of holy light. From his better forward position, Remar gives hand signals to Draven to assist his aim. Kasiex moves up some more and the undead horde starts to overtake the Ogre and Traldar. Shouting in Traldaran from somewhere else further in can be heard, "No retreat, Dogs! Traldar will fight!" Griffin charges ahead to get a better angle and Iris whispers, "Here goes nothing..." She casts her spell, but unfortunately it does not work. Draven calls quietly to Remar, "call the shot for me!" Remar assists Draven as he is feeling he can't smoke up the Traldar at this time. It seems incapacitating them among undead defeats the purpose of taking them out of combat safely! The wizard steps up and falls back into an old, almost forgotten role. Remar calls out the shot, providing Draven guidance, for once. There is a plethora of undead targets to hit and though the Ogre is being mobbed, he can still be hit as well. Draven let's loose the holy light, guided by the will of the gods and Remar's battle-tested skill. The Ogre attempts to dodge Draven's attack and fails! The Ogre yelps when the sunbolt strikes him! Griffin charges ahead to get a better angle just as a ghoul leaps out from around the corner and slashes at Remar! It swings at Remar's face with a clawed hand and succeeds! Another Wight rushes out and charges Kasiex! Remar lashes out with a flaming jet and the Ghoul attempts to dodge the attack and fails! Griffin steps up and draws a bead on the ogre while a Ghoul steps into close range and tries to grab Remar. 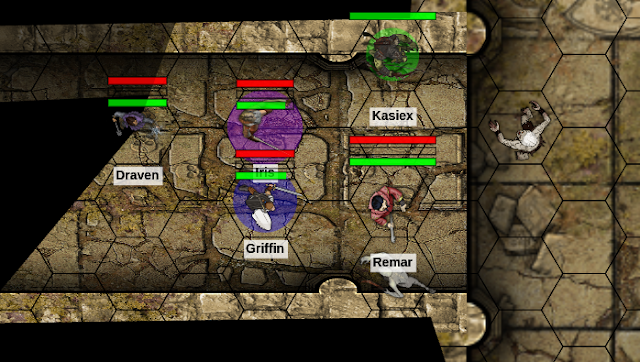 The Undead’s claws find purchase on the Alphatian mage but Remar, using his martial training, bats the grapple aside! Iris shoots her crossbow and the Wight attempts to dodge Iris's attack but fails and the bolt sinks into the rotting flesh of the wight! She smiles to herself at overcoming her fear. Remar attempts to brand deep into the Ghoul’s side with his flaming jet. The Ghoul attempts to dodge Remar's attack but fails! Remar laughs, "It's the slow-roasting, that burninates!" Draven continues to chant as the holy power builds in him, slowing stepping towards the enemy. Drops his bow and draws his curved blade. Nearby, Griffin switches aim and shoots the ghoul in front of him. The beast attempts to dodge Griffin's attack and fails! The bolt sinks into its chest deeply. The Ghoul looks up at Griffin and licks its lip! Griffin slings his crossbow and fast-draws Serenity. The Ghoul swings at Griffin's torso with its claws and succeeds! Griffin tries to parry but fails, fortunately his armor absorbs the blow. Wight swings at Kasiex's torso with a claws and succeeds! Kasiex attempts to dodge Wight's attack and fails. He groans as the Wight strikes him. Iris drops her crossbow at her side and walks forward, drawing her sabre with preternatural speed. Remar steps up behind the Ghoul that seems to have retreated from him and says, "Leave off my friend fiend. I wasn't through with you yet!" He thrusts with his flaming jet and shouts, "Yes, yes! Take it in all the way deep inside you! It burns so good!" Remar Watches as the ghoul bursts into flames from the inside-out and falls to ash before getting to Draven. Draven draws down the last of the holy authority and focuses his attention on the wight while Kasiex swings at its neck with a khopesh and succeeds! The Wight tries to dodge Kasiex's attack and fails and Kasiex's blade chops heavily through the Wights neck, nearly all the way through. The undead abomination merely smiles, flops its head forward and continues the melee! Iris looks on in abject horror. Nearby, Griffin performs a Rapid Strike against his opponent. The Ghoul attempts to dodge Griffin's attack and fails! Griffin starts to carve up the Ghoul’s rubbery, dead flesh. Iris swings her saber a Wight as it stumbles back, trying to dodge her strike! Her blade cuts into the undead flesh. Remar bolts the Ogre right in the face from across the way. The Ogre is struggling mightily against a horde of undead trying to pull him down! The bolt smashes the Ogre in his face. He falters and goes down to his knees. the Undead swarm over him! Draven channels the fury of his many gods through him. He is briefly lit from within as it courses out through his holy symbol and into the wight. The light suffuses the wight and suddenly it is simply not there. No corpse, no ash, nothing remains of the foul creature. Kasiex steps up, ready to slash the Wight again, but it disappears in a flash of holy light. He steps back quickly toward his bow and looks to his companions? asiex says "Now what?"